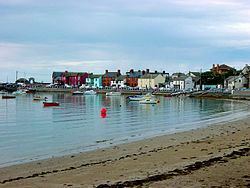 Skerries (Irish: Na Sceirí, meaning "The Rocks") is a seaside town in north County Dublin, Ireland. The name comes from the Norse word skere which has descended into the Irish word na sceirí which means the rocks. Skerries is also a parish in the Fingal North deanery of the Roman Catholic Archdiocese of Dublin. 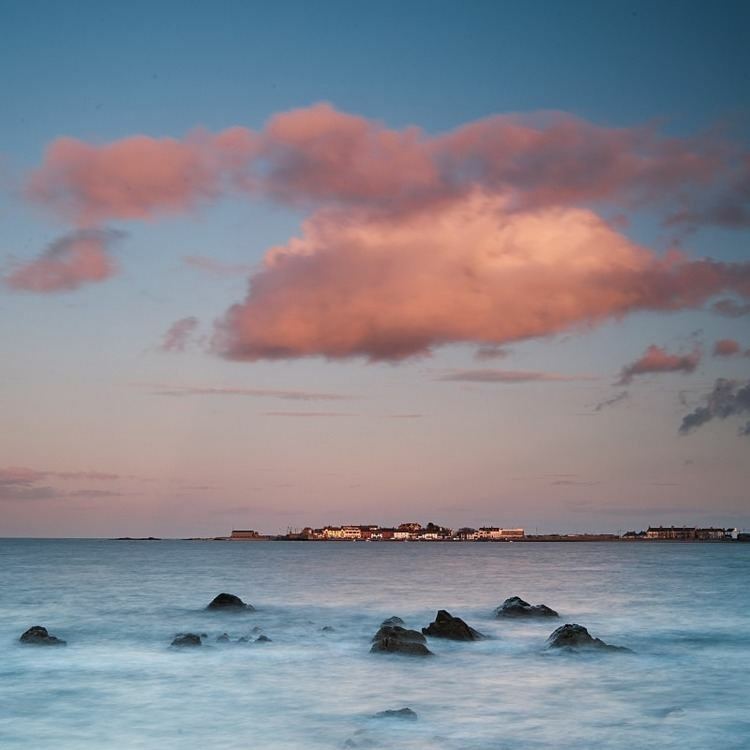 Skerries has five islands off its coast called Shenick Island, St Patrick's, Colt and Rockabill. Rockabill is in fact two islands, "The Cow" and "The Calf", separated by a narrow channel. There is also Red Island, which is a tied island. 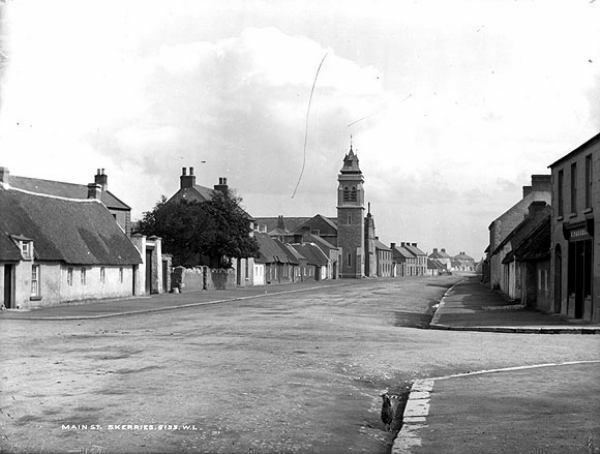 The town itself is built around two long streets - Strand Street and Church Street and between the surrounding hills of North Fingal and low-lying beaches. Skerries South Strand is a long sandy beach 2.5 km long. Red Island, Mill Hill, Hillside, The public Ardgillan Park and Demesne, Barnageera and to a lesser extent Baldungan Castle are high points on which you can look over the town. Rockabill has the largest numbers of breeding roseate terns in Europe. It is also the farthest away from the town and has a lighthouse which is located 4 miles from the closest path on Red Island. On Shenick Island can be found a Martello tower, one of a number of defensive towers erected during the Napoleonic era along the Irish coast by the British. The tower is 1 mile from the great windmill and approximately 1 mile from another Martello tower on Red Island and the Monument on Strand Street. Shenick is accessible on foot at the lowest tides, but this is inadvisable, due to the relatively rapid fill caused by the turning tide. The other islands are harder to reach, but it is possible by boat. St Patrick's Island is so called because this is where the Irish patron saint is reputed to have landed and begun his mission to convert the country to Christianity. Early writers tell how an island off Skerries was used as a landing place for an invasion, which happened in the second century. This island was either Shenick or Red Island, which would have been a tidal island at the time. When the invaders landed, they formed ranks and at low tide marched to the mainland, where they were promptly defeated at the ancient settlement of Knocknagin, north of Balbriggan. The islands were previously known as the Islands of Cor possibly after the original inhabitants. As noted, in 432 AD, St. Patrick landed on Church Island, and according to the Annals of Inisfallen Saint Mochonna founded a monastery shortly afterwards. In 797 AD, the Vikings (or Danes) carried out one of their earliest raids in Ireland when they plundered the monastery on Church Island. As the origin of the name is Norse and many localities have Norse-based names, it is safe to assume the Vikings did settle and occupy the area. Sitric, who was a son of a Dane called Murchard, re-founded the monastery on Church Island in 1120. He dedicated it to St. Patrick, the Apostle of Ireland. By this time, the Danes who had settled in Ireland had become Christians. In 1148, Saint Malachy, Archbishop of Armagh, arranged a synod on St. Patrick's island to settle differences between the Irish Christians and the Pope. Fifteen Bishops, two hundred priests and other clergy were present. In 1320, the manor of Skerries was granted to Sir Michael le Veel; his descendants Anglicised their name to Calf. The Prior of Holmpatrick received permission to build a pier in 1496 from King Henry VII. At this time, Skerries was the property of the monastery of Holmpatrick and was known as the Port of Holmpatrick. In 1565, after the Reformation, the monastery and its lands became the property of Thomas Fitzpatrick. In 1605 the manor and lands of Holmpatrick were granted to the Earl of Thomond. In 1721 the last Earl sold the manor and lands, including the town of Skerries, to the Hamilton family of Hacketstown. In 1897, the Hamilton family were granted the title of Lord Holmpatrick. Comparisons between maps of Skerries drawn in 1703 and 1760 suggest that the Hamilton family was responsible for setting out the streets of the town as they are today. Between 1863 and 1865 a monument to the memory of James Hans Hamilton, the local landlord and MP, was erected in Skerries. After the 1916 rising, a British destroyer landed troops at Skerries to help the Dublin garrisons suppress the rising. 200 men of the North Staffordshire Regiment landed under the command of Captain Clay. To try to impede their progress to Dublin, local rebels blew up the bridge over the railway in Donabate. During the Irish Civil War in 1922, Harry Boland was mortally wounded while being taken into custody by Irish Free State forces at the Skerries Grand Hotel. Historically, Skerries has been a thriving fishing port and a major centre of hand embroidery. In the late 20th century, it became a resort town (golf, sailing, motorcycling, etc. ), and a dormitory town for commuters to the city of Dublin. In common with much of Dublin's hinterland, Skerries saw massive growth in residential property and associated prices during the late 1990s and early 21st century. Old family names include Shiels, Duff, Grimes and Branagan. The Shiels family date back to the 1830s. One later member of the family, Joe, was involved in the Howth Gun Running in the lead up to the 1916 Rising. He served 18 months in Wakefield Gaol in England. The town has one-second level institution, Skerries Community College, originally named the Holy Faith/De La Salle College. The college originates from 1982, following a merger of the De La Salle College, Skerries Vocational School, and the Holy Faith Convent. It has on average 1000 students over 6 year levels (1st to 6th year, including optional transition year. It is a "co-ed" school meaning for both male and female students, unlike the institutions the college merged from. As for primary schools, there are four in the town: Réalt na Mara national school (n.s. ), St. Patricks n.s., Holm Patricks n.s. and Educate Together Skerries N.S.. There are many preschool options in the town, these are mostly family run. In the early 1950s, a holiday camp was built on Red Island by the Quinn family, founders of the Superquinn supermarket chain. The camp was then sold some years later to Swords auctioneer Shane Redmond. The camp had 250 bedrooms all under one roof, along with the dining and entertainment areas. In this respect, the accommodation at Red Island differed from more typical chalet facilities at other camps, such as Butlin's. The holiday business closed in the early 1970s, as competition from foreign resorts became cheaper and more accessible. The ballroom continued in use as a venue for pop and rock groups such as Horslips and Thin Lizzy, until all the buildings were eventually demolished in the 1980s. Red Island is now an amenity area for the local community, with a playground, and swimming areas. The Skerries martello tower is part of a chain of towers constructed in the early 19th Century. They were built by the British, along the Irish and English coasts. They were to serve as protection from Napoleonic French armies (In the scenario of an invasion) and as an early warning system against an attack. More information can be found on the Martello Tower page. The tower in Skerries was used as part of the Red Island Holiday Camp. Since that was demolished in the 1980s, the tower has stood alone. In Flann O'Brien's book The Dalkey Archive, Skerries is the location of the narrator's meeting with James Joyce. The narrator has heard a rumour that Joyce has returned from the continent and is working in a small country pub. He tracks him down to a place on the outskirts of Skerries, but Joyce denies all knowledge of "that filthy book" Ulysses. Casey, one of Reegan's subordinate officers in John McGahern's first novel, The Barracks, is described as having previously been stationed in Skerries where he also met his wife, Teresa. In conversation with Elizabeth Reegan, the novel's protagonist, Casey describes his "great life there, near the city; the market gardening, places you couldn't throw a stone without breaking glass", while Teresa recalls the evening she met her husband: "You could still hear the music from the pavilion and it was comin' across from Red Island too, Mick Delahunty playing there that night. There was a big moon over the masts of the fishin' fleet. I knew he was mad for a court". Skerries has a vibrant and long-running musical tradition from Tony Keeling and the Graduates in the showband days, right through to the modern day era with bands like Primordial and Dem Fools keeping the Skerries flag flying in both global and local music scenes respectively. Extreme metal band Primordial, which combines Black Metal and Doom Metal with Irish folk music, was formed in Skerries. Ryan O'Shaughnessy, the singer-songwriter and former actor, originates from Skerries. Skerries has received numerous awards in the past for its beautiful scenery, rich culture, and constructive community. Skerries came second in all of Ireland in the 2014 Best Place to Live in Ireland awards. The town is also the only place to have won an award as an entire community at RTÉ & Rehab's People of the Year Awards in 2011. In 2016, Skerries was named Ireland's Tidiest Town by the Supervalu National Tidy Towns competition out of 859 towns and villages throughout the country that were considered. Skerries was rated as one of Europe's ten most beautiful cities by the popular Eating Europe Food Tours blog, alongside cities such as Rome, Barcelona, Prague, and London. Skerries Harps GAA is the local Gaelic Athletic Association club. Skerries Town Football Club is the local soccer team in the area. Skerries Sailing Club located by the harbour, is the home to a thriving dinghy and cruiser fleet and perhaps the largest fleet of "Optimists" (sailed by under 16s) in Ireland. Jewventus FC is the local Airtricity League club.